The haulout at Astilleros de Mallorca starts with a full surface preparation on metal and wooden hulls. High pressure water, hydro blasting and glass bead blasting are all part of our arsenal. All treatments are environmentally friendly and all preparations are carried out with ISO 14001 compliance. 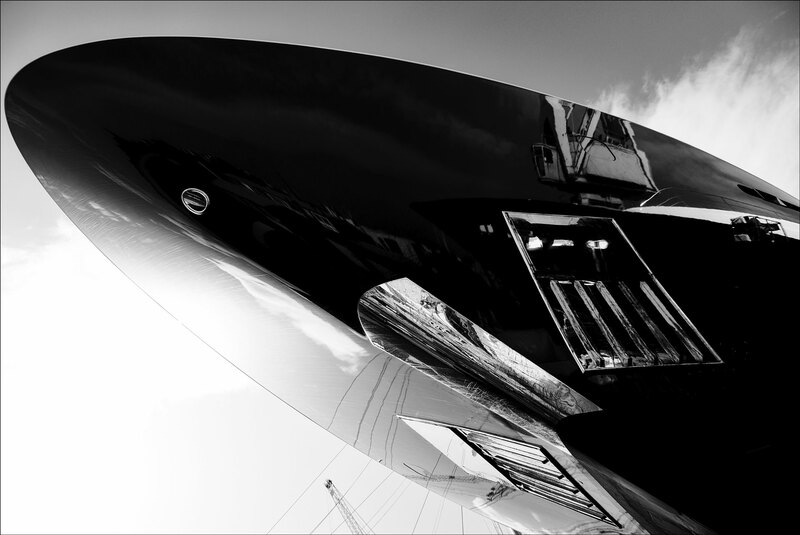 The final finish on any yacht is the pride of every owner, which is why we liaise with top subcontractors in the industry, in order to ensure a fault-free finish on hulls, superstructures and rigs. Our experience in the construction of commercial vessels gives us unique insight into combining new technologies and time-honoured techniques. This expertise has led to massive efficiency and cost-savings, as well as great precision in our methods. Steel and aluminium welding: our team of welders are equally conversant with all types of welding, producing high grade finishes and always meeting ISO specifications and classification society certifications. Hull and decks are cut and replaced as necessary while the aluminium superstructures are crafted to a high degree of accuracy, avoiding the often challenging threat of distortion in the softer alloy. We have a specialised department for stainless steel and fine metal works. We design and manufacture marine deck equipment, including awnings, staircases, railings, stanchions and vessel access systems, as well as swim platforms. Astilleros de Mallorca´s capabilities include a fully qualified engineering department, a machine workshop, and the equipment and personnel required to carry out field service work in specialist subjects. Measuring and dynamic balancing of variable and fixed propellers. Clearance measurements of shaft lines and rudders. Line boring of stern tubes, shaft brackets and rudder tubes. We have invested in latest-generation hydraulic equipment, to service the full range of basic maintenance to heavy repair and hydraulic refitting. Modern vessels are continually becoming more dependent on both electrical and electronic systems. This results in a constant demand for repairs, modifications, upgrades and troubleshooting. Our experienced staff combine their electrical background with a present-day supply system of spares and new components. Our electrical installation team provides certificates for classification societies for a complete refit/repair and will always advise on the latest legislation and standards. We work with both local and leading companies globally in all aspects of HVAC. The love for woodcraft was born in the very heart of the shipyard. Our skilled craftsmen have a special sense for this unique and natural material. They are well versed in the widest range of materials, methods and technologies, be it teak, veneers, parquetry or composites. Either for standard glass-reinforced repairs or for leading edge carbon fibre components, we have expert companies with whom we work regularly, both from Mallorca and overseas. Combining our skills with those of associated reputable partners, we offer the most precise methodology for yacht painting and finishing. Coordination and quality control along the whole process are key for a successful repaint project. When an owner purchases a yacht, they want to carve their mark on it, personalise it, make it their own. Working with the owner's favourite interior designer and their preferred interior outfitter, the shipyard team coordinates and takes care of all the ancillary services. At Astilleros we have on hand, if required, services such as marble, upholstery, soft furnishings and the all-important entertainment specialists. We can deliver you your yacht to enjoy; just as though having ordered a ‘new build’. Being Palma, the capital of sailing superyachts, we have a wide variety of top rigging companies with whom we work on a regular basis, including an in-house company especially dedicated to running rigging.